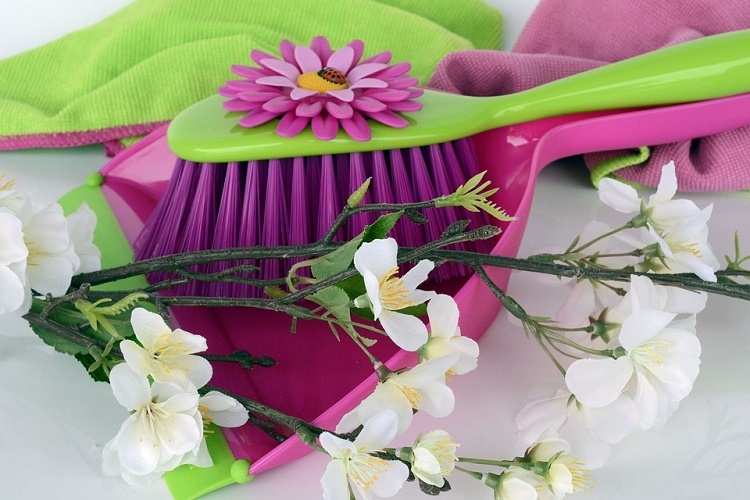 Want some tips and easy ways to spring clean your home like a pro? Here are some easy ways to spring clean the house with this ‘deep clean your house’ checklist. An easy way to spring clean the house is the start with a list. Find out the areas than need cleaning. You can then assign different cleaning tasks to members of your family. Ask each member what s/he would like to do. You might need to haggle a bit about unpleasant tasks like cleaning the toilets, attic, and basement, or hand washing the light fixtures and doing the compost or garden area. Before you start cleaning, make sure you have everything you need. You might need to buy vinegar, baking soda, household multi-purpose cleaners, sponges, scrubs, cleaning cloth, mops, brooms, window cleaners, etc. Also buy gloves, gardening supplies or garden tools. If you are too tired to cook on the day you choose to spring clean, order a pizza which will make it exciting for the family to clean. To get started, crank up the music! Clean the insides of cabinets. Dust the cookbooks and throw out recipes/books you do not need. Use a degreaser like vinegar and baking soda to remove oily stains from the walls. Wipe down pantry shelves with cleaners. Line the insides of shelves and drawers with clean paper; discard stuff you no longer need. Reorganize cabinets and pantry. Clean the refrigerator with vinegar and soda. Throw out stale food, unused bottles of sauces etc. Place a new box of baking soda in the fridge to absorb smells. Also deep clean the oven, toaster, microwave and other appliances. Wipe down grease spatters from walls and backsplash. Clean the sink. Scrub the faucets to remove stains. Empty the trashcan and clean it out. Leave it out to dry. Sweet/vacuum the floor, carpets and rugs. Wash any throws and rugs. Clean the windows. Wash the curtains if any. Caulk the cracks and crevices to deter bugs. Clean the tub, sink and toilets with bleach or vinegar and baking soda. Soak the shower head in vinegar to remove salts. Clean and rearrange stuff inside the medicine cabinets/vanity. Get rid of expired medicines, creams, lotions etc. Wipe down the floors and windows. Clean the toothbrush holders and soap dispensers. Replace or clean old shower curtains. Re-caulk or seal cracks and crevices to deter bugs. Wash bedding/linen/covers and curtains and throws. Dust the beds or leave them in the sun for a few hours. Clean the bedding. Air out rugs, throws, upholstery etc. Discard old clothes and books or arrange them in boxes to donate them. Rearrange the clothes and books still being used. Pack away seasonal items to make way for summer/spring stuff. Store clothes for younger siblings if any by vacuum sealing them in special storage bags. Wipe down the sofas, couches and other furniture. Dust the coffee table, chairs, bookcases, mantle etc. Air out rugs, throw pillows in the sun. Clean the TV, remote etc. Throw out DVDs you do not use any more. Wash or replace table linen. Get rid of things you no longer need. Reorganize the cabinet and discard clothes you no longer need. Vacuum out the dryer vent. Arrange shoes in the foyer cabinet. Remove winter jackets and add spring ones. Sweep, clean, mop and dust. Reorganize stuff into piles or boxes. Discard things you no longer use. Mark and label boxes with tools, seasonal decorations etc. Wash the windows and door. And that’s it-you are done! Your spring cleaning is officially complete. Take a break-you deserve it!